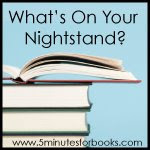 It's hard to believe but it is time for the monthly What's on Your Nightstand? post! The year is just flying by! Just One of the Guys by Kristan Higgins - It got rave reviews over at Dear Author so I thought I would give it a go even though I don't read a lot of contemporary romance. Personal Demon by Kelley Armstrong - I really enjoy all the Women of the Otherworld books. From the thrill of the break-in, I presumed, but when he pulled back, there was trepidation in his eyes, lifting only when I leaned in for another kiss. I am only in the very early stages of the book, but I have to say that I am eager to know exactly who HE is and what break-in. Damn! Looks like a teased myself! I haven't read Personal Demon yet but I just love that series!!! It's a great series isn't it! I fully expect to enjoy it....when I get around to reading it! Ooo, Personal Demon. I love Kelley Armstrong. I'll be interested to see what you say! Hey, BTW, were you being funny over at my blog? You know, those photos aren't really us, but American movie stars and socialites. I did wonder about a couple of the photos - looked a bit top modelish, but I didn't recognise any of them as stars or socialites. Still would have been the one taking the photos! hehe don't worry I am still reading my 1 book from last month :-P Sounds like some good books on your list. This is the second time today I've seen Tuesday Teaser. Looks fun! Thanks for joining in the carnival again. My nightstand pile never seems to get very big since lately I stay up until the book I'm reading is done. Theonly one I have that I'm working my way through slowly right now is The Pink Forest by Dana Dorfman. It's an interactive fiction about one woman's search to discover her inner self and is providing me with lots of food for thought and journal entries.